Distinctive lady's ring for everyday wear or that super special occasion. Solid sterling silver, genuine gemstones, and fine craftsmanship. Trendy but with a touch of Southwest flair that is always exciting! Meaures approx 1.5" long (see ruler image). SIZE NOTE: Given the wider shank, we suggest ordering 1 size larger than you normally would. GEMSTONES NOTE: Due to the nature of these gemstones, variations in colors/shades and imperfections are normal. Our turquoise has been stabilized, treated, and color-enhanced for beauty and durability. Satisfaction always guaranteed. Genuine Gemstones (color/shades/matrix will vary). 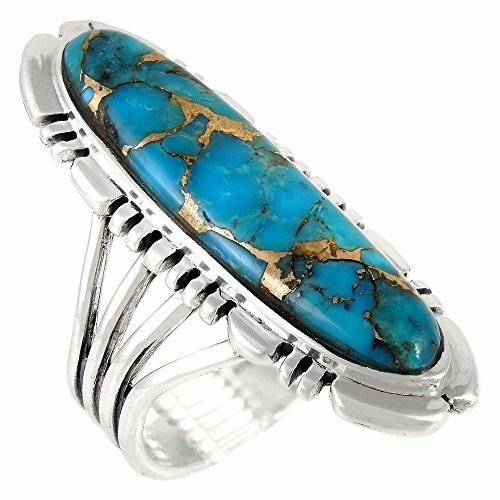 Our turquoise is genuine turquoise that has been stabilized, treated & color-enhanced.